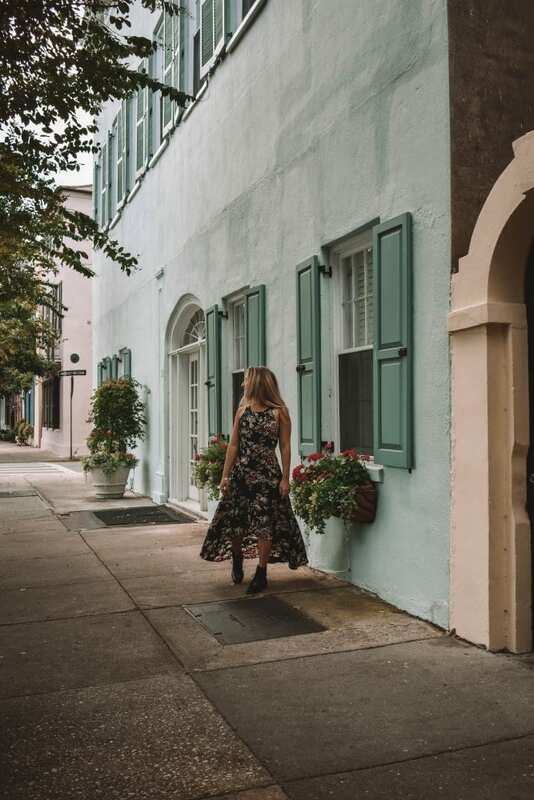 Charleston is the perfect long weekend getaway! 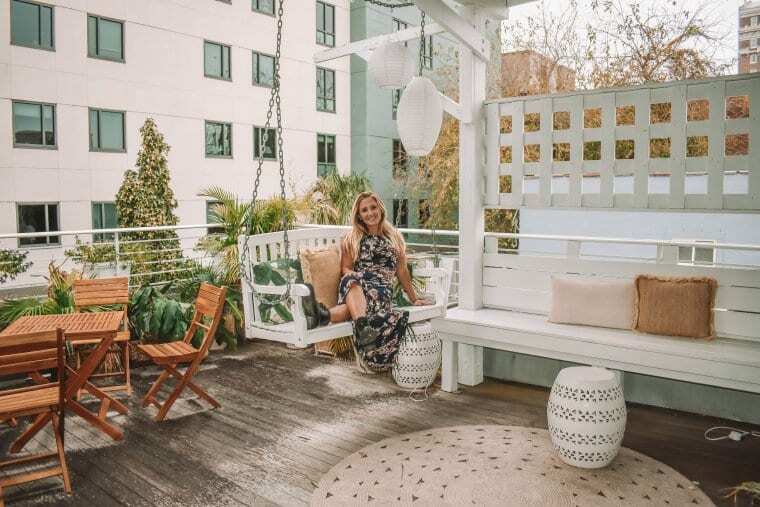 Whether you are traveling through the United States and want to explore the American South; you live in the North and are looking for a warm getaway; you are looking to do a girls’ weekend or celebrate a Bachelorette party; you want to do a cute couple’s getaway or you even want to do a fun family vacation, Charleston is great for all to enjoy. 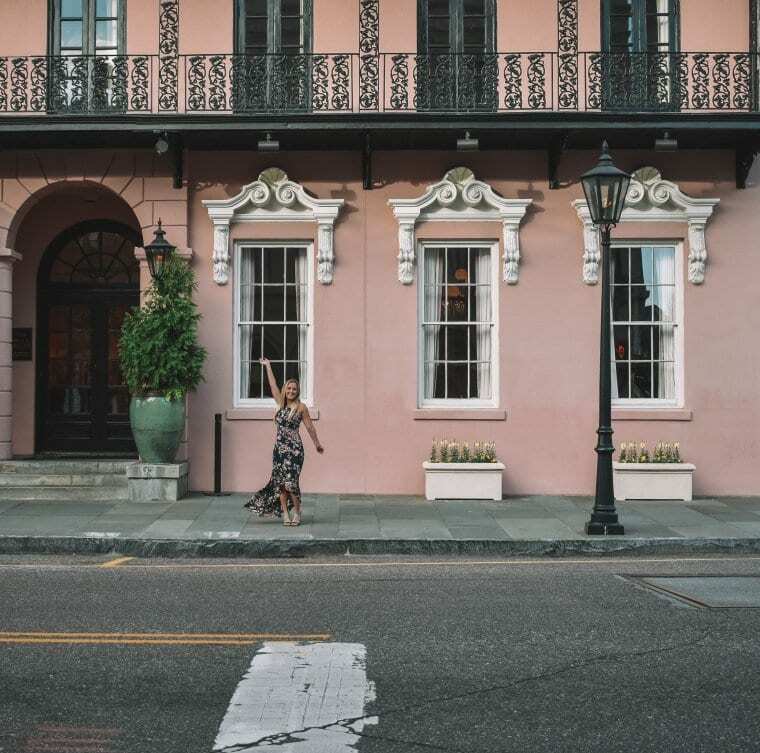 The city is filled with bright colors, pineapples, amazing southern comfort food, wonderful history, beautiful hotels, stunning houses and architecture, serene nature and so much more! 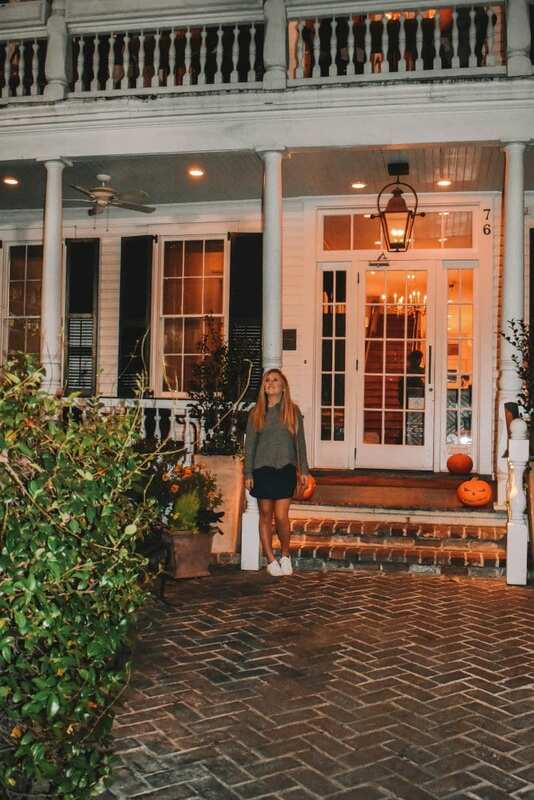 My cousin Sophie currently attends the College of Charleston and was on fall break, so my mom and I decided to fly there during the first full weekend of November to visit her and explore the city. We flew to Charleston on a Saturday afternoon and left on a Tuesday afternoon. The amount of time we were in Charleston was great for a long weekend escape and the weather was perfect! 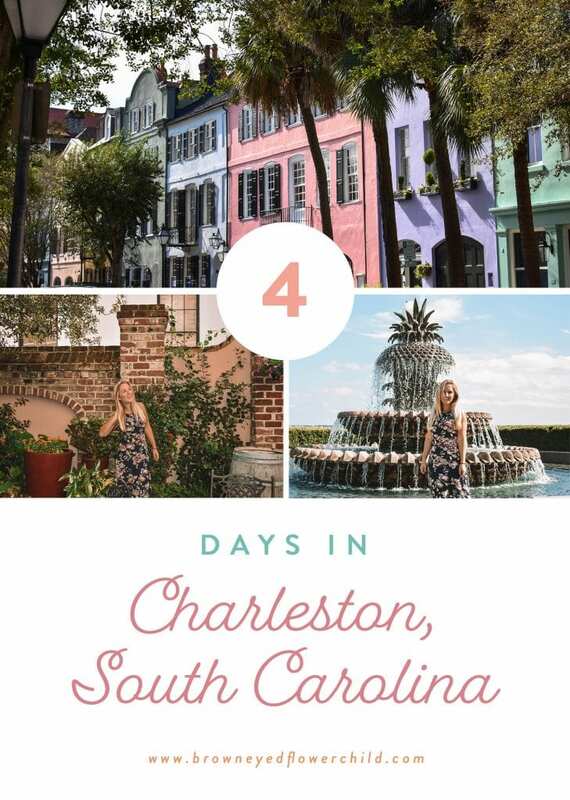 Check out my long weekend travel guide to Charleston, South Carolina! **Please note that this blog post uses affiliate links meaning that if you make a purchase via my affiliate link, I receive a small commission at no additional cost to you. I only promote and talk about products and services that I have used and like. My mom and I got so lucky and found round trip flights for less than $200 together through Skyscanner! It was definitely a score. To top it off, the flight was literally a hop, skip and a jump from New Jersey. We left Newark on Saturday afternoon at 2pm and arrived in Charleston around 4pm, leaving us time to enjoy a perfect Southern evening. 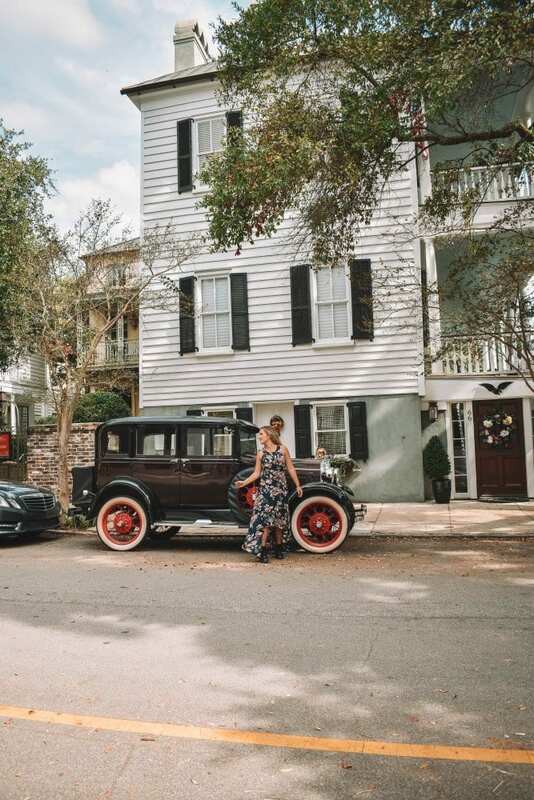 If you live in the South, traveling to Charleston could be done easily by doing a renting a car. There are also trains and buses that go to and from specific cities. 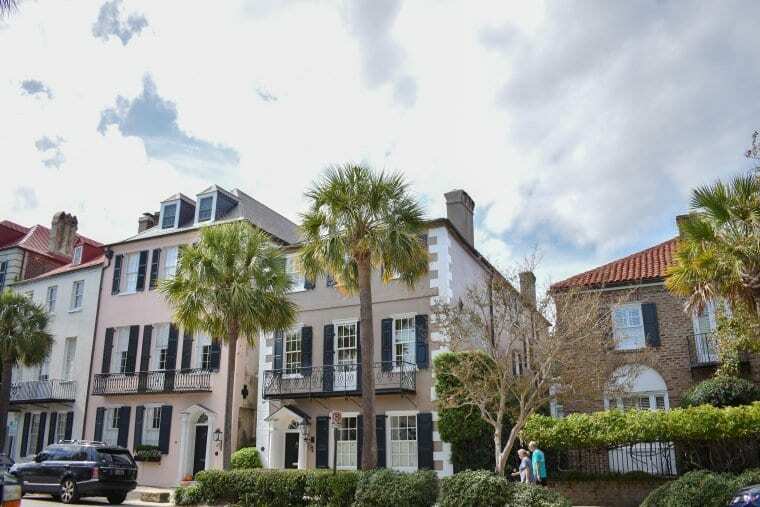 In addition, it is fairly easy and reasonable to Skyscanner to Charleston. 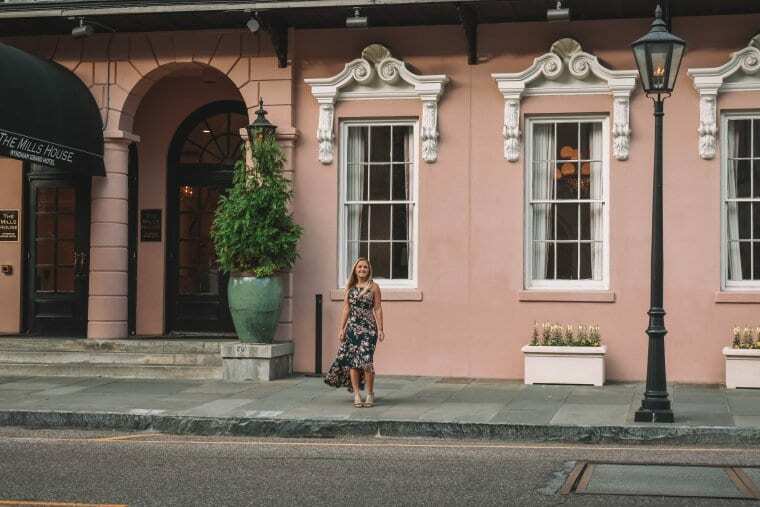 During our time in Charleston, we stayed at The Mills House Wyndham Grand Hotel and LOVED it! The hotel itself is historical and pretty in pink. 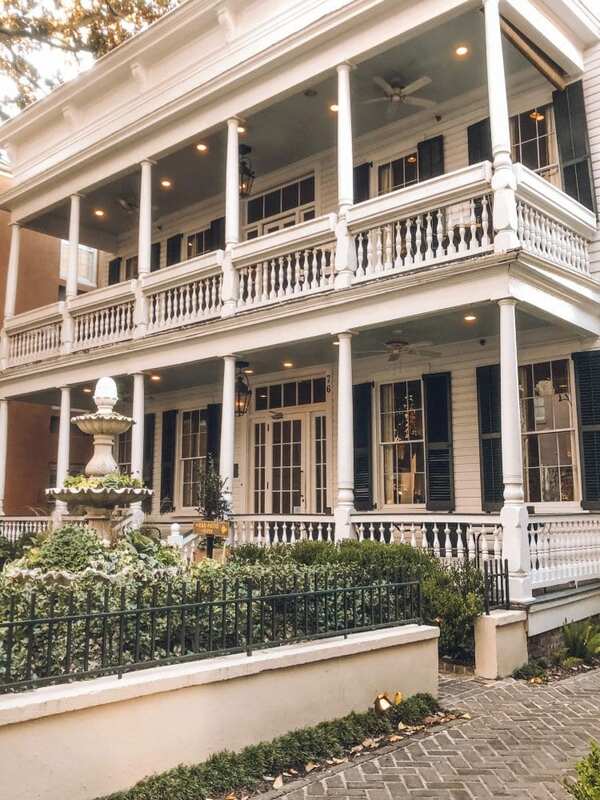 Featuring southern charm all throughout, The Mills House opened in 1853 and is situated in historic downtown Charleston near many popular attractions. The grounds and lobby are absolutely stunning and I couldn’t help but admire everything about it. 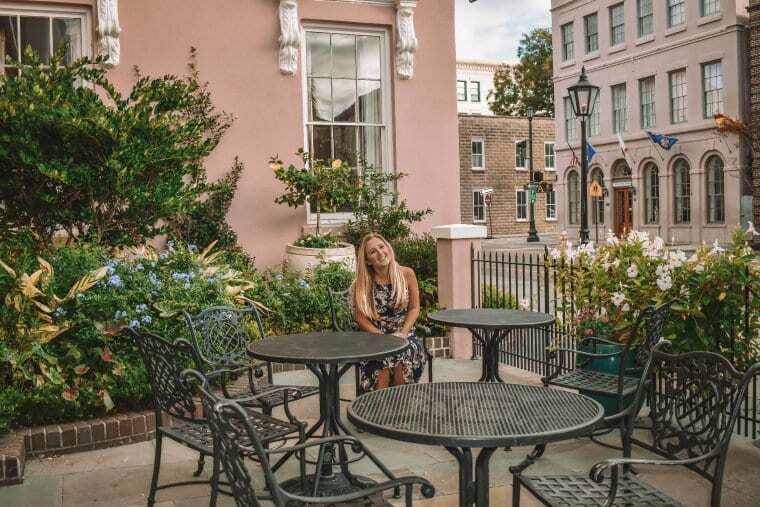 Every morning during our time in Charleston, my mom and I would head down to the hotel’s courtyard and enjoy the complimentary coffee and tea they had. 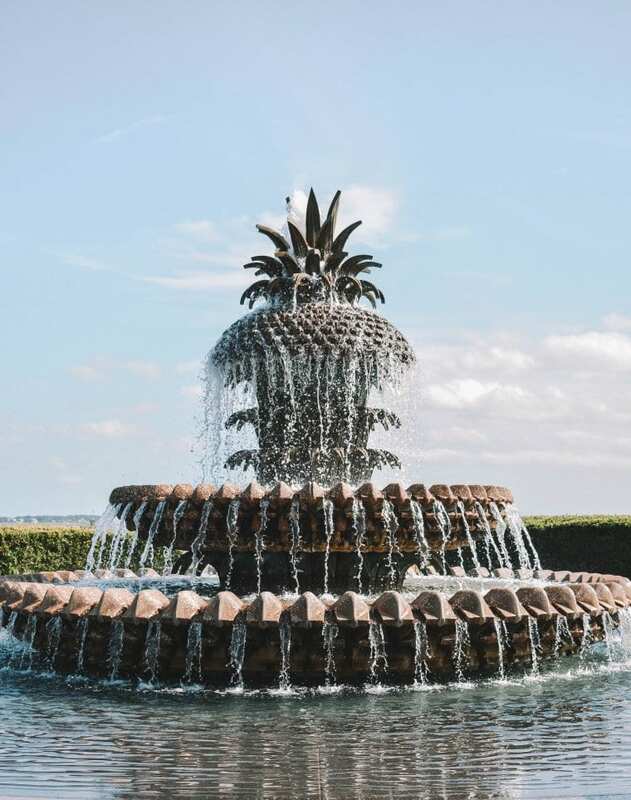 In the middle of the courtyard is a beautiful pineapple fountain that resembles the iconic Pineapple Fountain found in Charleston’s Waterfront Park. It is so relaxing and The Mills House will play comforting music in the background. Since The Mills House opened in 1853, there is a lot of history that stands with it. A local grain merchant named Otis Mills originally built the hotel. It survived the destruction of the Civil War, but was later burnt down due to a devastating fire that destroyed a huge chunk of Charleston. It was fully demolished in 1968 and was rebuilt a few years later. The façade is an exact replica of the original hotel, but the builders managed to squeeze an additional floor. Nowadays, it is a beautiful hotel that serves guests traveling from all over the world. It also holds weddings and corporate meetings and conferences. In addition to The Mills House, there are a plethora of other luxury, mid-budget/boutique and budget hotels throughout the city. There are also a wide range of Airbnb options as well. 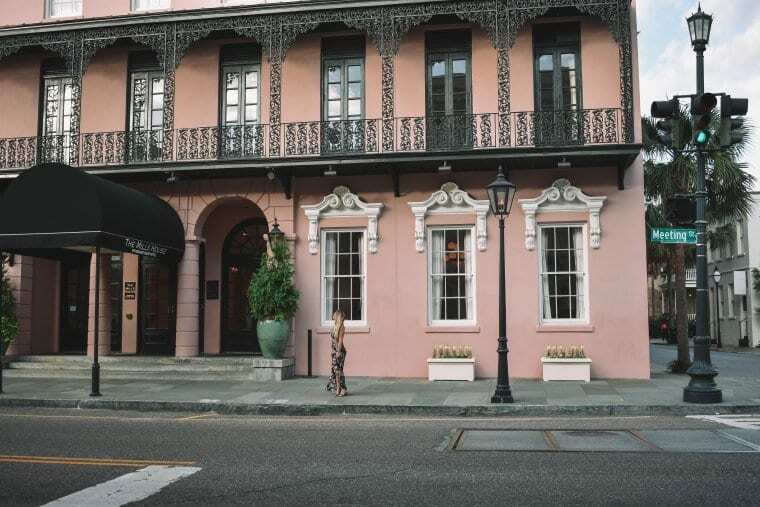 Charleston Architecture: After we landed and checked into The Mills House, we started walking through the city. I love how quaint Charleston is. Most of the houses still standing in the city have been there for centuries (of course, they have been updated with modern utilities). The architecture of the houses is a mix of Colonial, Georgian, Federal, Victorian and more. 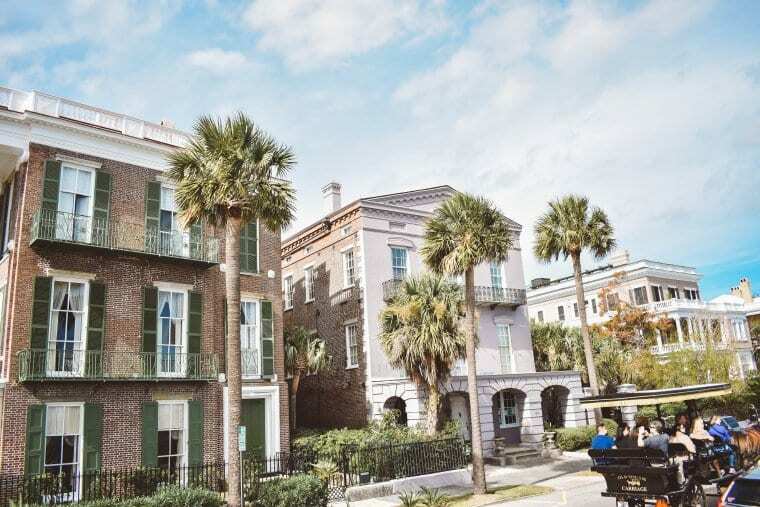 In addition to the beautiful architecture, a lot of the homes in Charleston are painted different colors as a tribute to Charleston’s Colonial/Caribbean heritage. King Street: Known as one of the top 10 streets in America, King Street boasts the city’s trendiest restaurants, bars, hotels, art galleries, clothing boutiques, coffee shops and so much more. It is a shopper’s dream! You could find top retailers such as Forever 21, Victoria’s Secret, Urban Outfitters, Anthropologie, Pottery Barn, Gap and so much more. You could also find wonderful oyster bars, sushi houses, pizza joints, ice cream shops, biscuit cafés, rooftops, wine bars and I could go on. There is nothing like strolling through King Street during sunset. 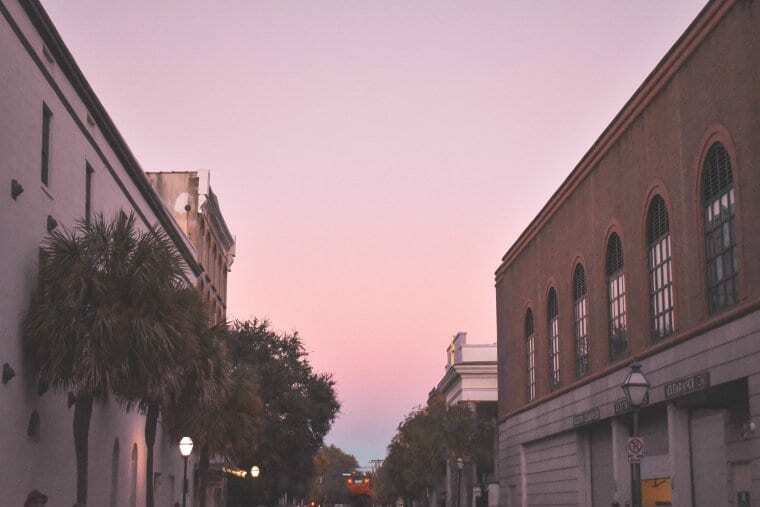 Between all of the pastel colors, palm trees and orange and purple skies, King Street shines like magic during golden hour. Lowcountry Dinner: Prior to traveling to Charleston, I had never heard of the word “lowcountry” before. When I first arrived in the city, all I saw and heard was “lowcountry”. A few hours later, when we went to dinner, I found out that it is the name of the geographic and cultural region along South Carolina’s coast, including the Sea Islands. Since Charleston’s cuisine is catered to lowcountry classics, we decided to have it for dinner. One thing to note about going out to dinner in Charleston is that you will need to make reservations on a Friday and Saturday night. You will also need to make reservations for brunch on a Saturday and Sunday morning. When we were trying to make dinner plans that Saturday night, we were having a difficult time trying to find a place that had open seating for three people. 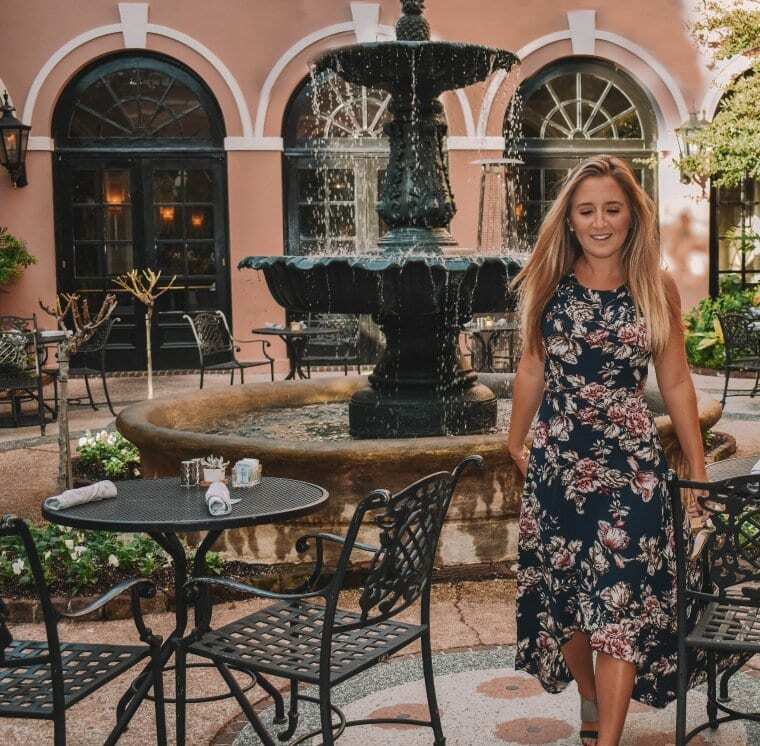 We were lucky enough to find a charming restaurant right next to The Mills House that served some of the best lowcountry food in Charleston. 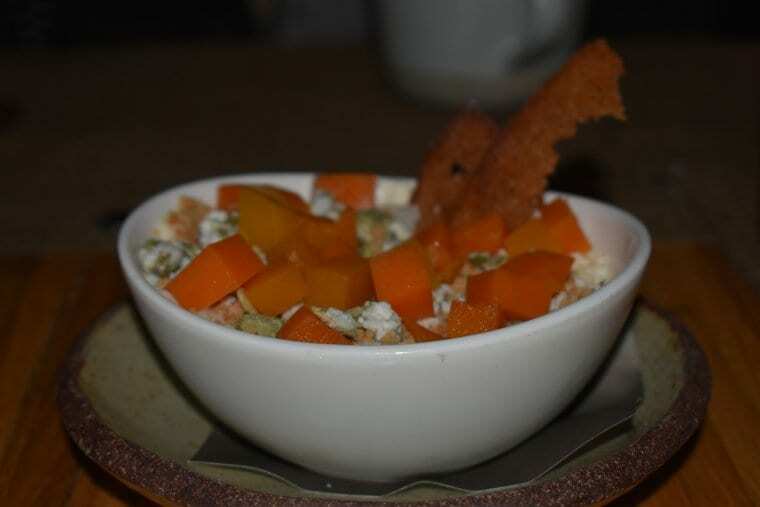 Located in a beautiful Federal-style house is Husk Restaurant. Since it was a beautiful night, we sat outside on the porch on the restaurant’s second floor. It was nice to be able to sit under gas lamps and enjoy amazing food. As an appetizer, we all enjoyed Husk’s freshly-baked cornbread that came with a delicious fall butter. (I usually do not eat butter with my bread, but that one was amazing!) For the main course, my mom and I had the lowcountry cider-glazed roasted chicken with vegetables and southern dumplings. It was absolutely amazing! To top it all, my cousin and I enjoyed a pumpkin blondie topped with a maple panna cotta. It was to die for! I enjoyed all of these delicious items with a South Carolina cider. Lowcountry Brunch: One of my favorite things to do during a U.S. trip is to get brunch on a Saturday or Sunday morning. I will admit that I brunched more in my earlier 20s, but to save money and calories, I tend to brunch when I am visiting another city now. On our second day in Charleston, Sophie, my mom and I went to a nice jazz restaurant that offered wonderful lowcountry brunch options. 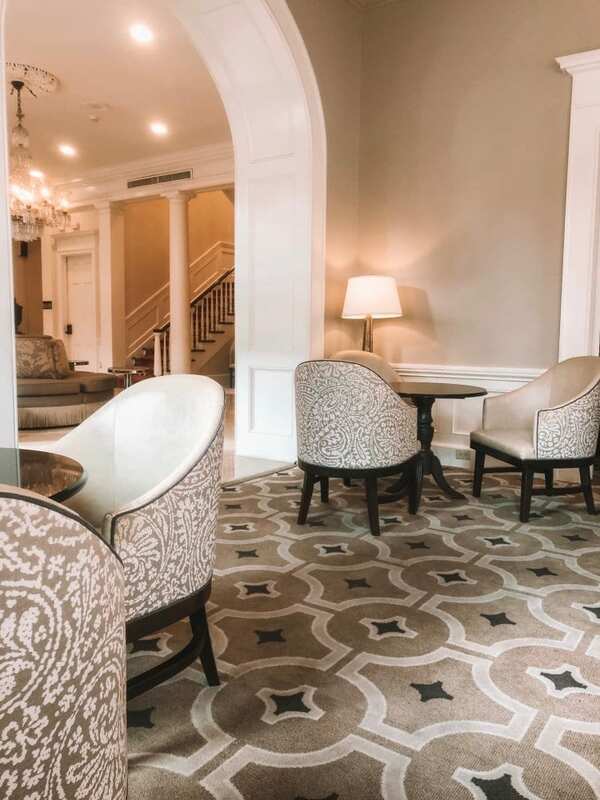 Located in Downtown Charleston, a few blocks away from The Mills House, is High Cotton. Featuring beautiful and open dining rooms, High Cotton is the perfect place to start your weekend morning. 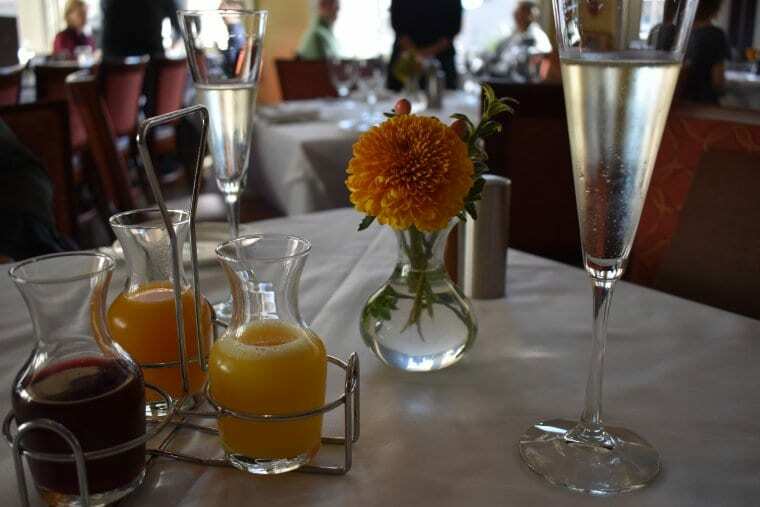 For brunch, High Cotton offers a great mimosa trio where you could get a full or half a bottle of Champagne with carafes of peach nectar, pomegranate and orange juice. (I definitely recommend getting this and it is perfect to share!) 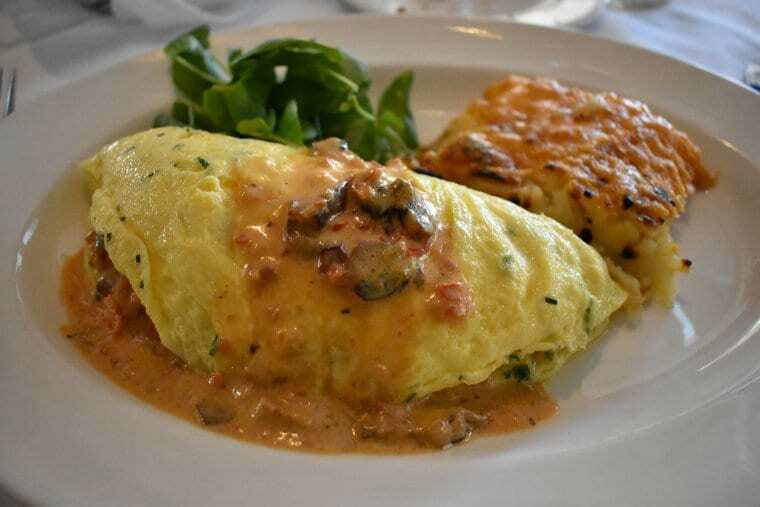 For my main brunch meal, I enjoyed a lobster and bacon omelet with hash browns. It was just as amazing as it sounds and looks! In addition to offering amazing food for brunch and dinner, the restaurant will also bring in local jazz bands! Waterfront Park: After our amazing brunch, we had to walk off everything we ate, so we walked through some of Charleston’s gems. Our first stop was to Waterfront Park, which is one of the lowcountry’s most visited parks. 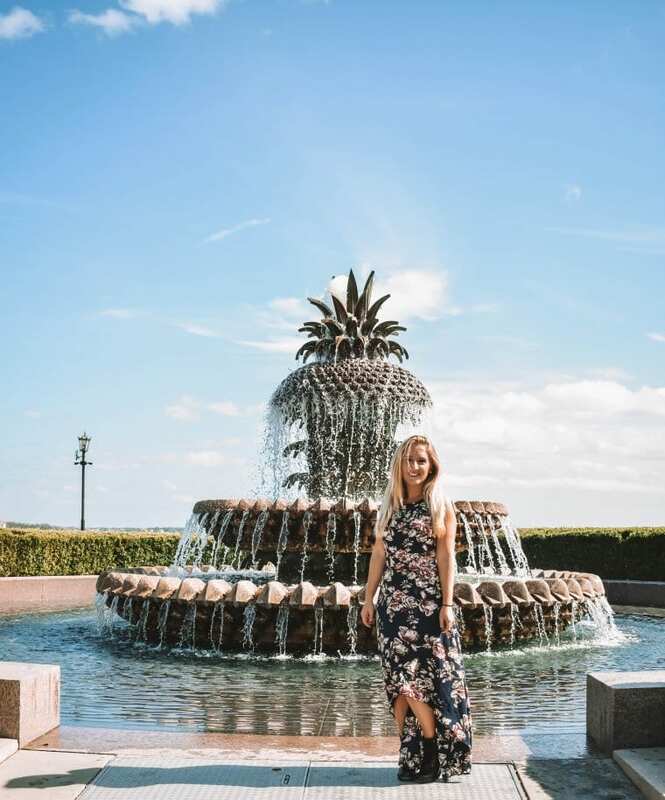 This beautiful park is a great place to take a stroll and enjoy the views of the Charleston Harbor, Ravenel Bridge (Charleston’s iconic suspension bridge), gardens, famous Pineapple Fountain and more. The Pineapple Fountain is one of the top attractions at Waterfront Park. No matter where you go in Charleston, you will find pineapple statues and logos everywhere. It symbolizes hospitality. 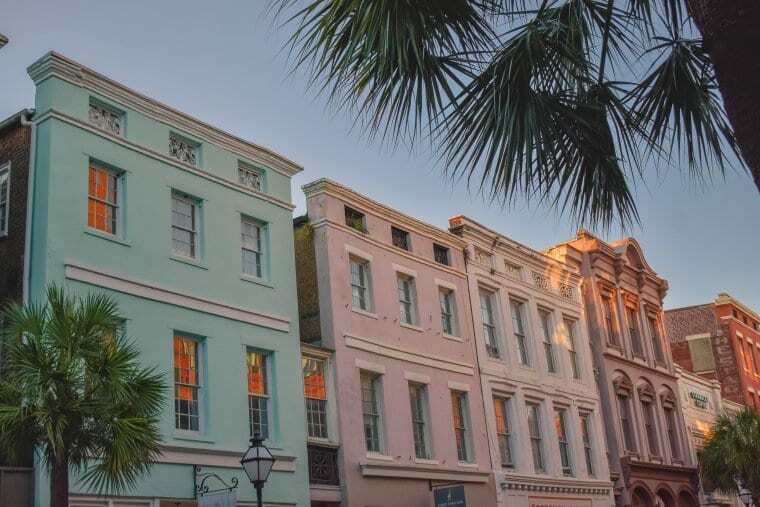 Rainbow Row: The iconic Rainbow Row in downtown Charleston is a row of pastel-colored historic homes. It is absolutely beautiful and charming, but please note that there will be a lot of people taking photos at this spot. Legend has it that the true reason for the colors of Rainbow Row were so that drunk sailors would be able to find their way home easier. 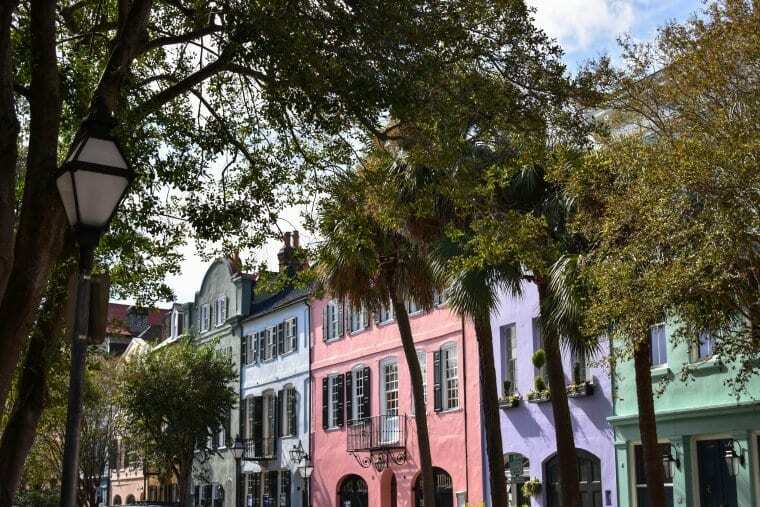 Others believe that they were painted lighter to keep them cooler during Charleston’s hot and humid summers. 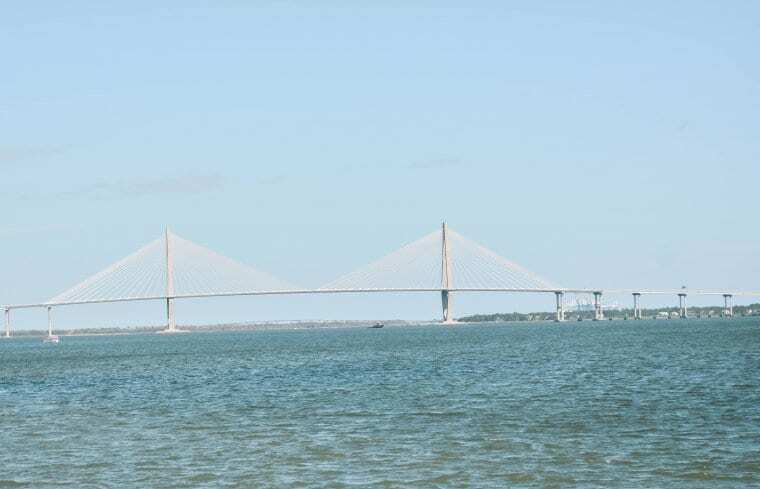 The Battery: Located on the lower shores of the Charleston peninsula is The Battery. This landmark is a defensive seawall and promenade in Charleston and it was named for a Civil War coastal defense artillery battery at the site. 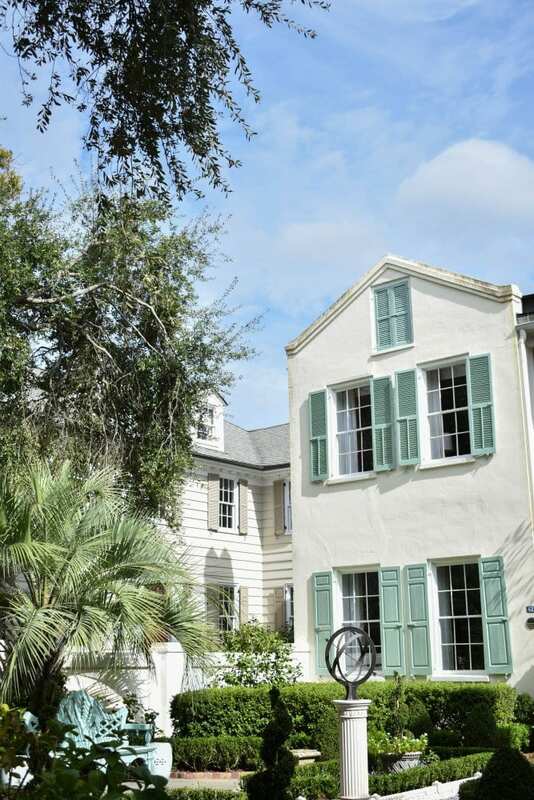 In addition to its history, The Battery also has some gorgeous historical mansions to admire! What is crazy to think is that a lot of these mansions are worth tens of millions of U.S. dollars. 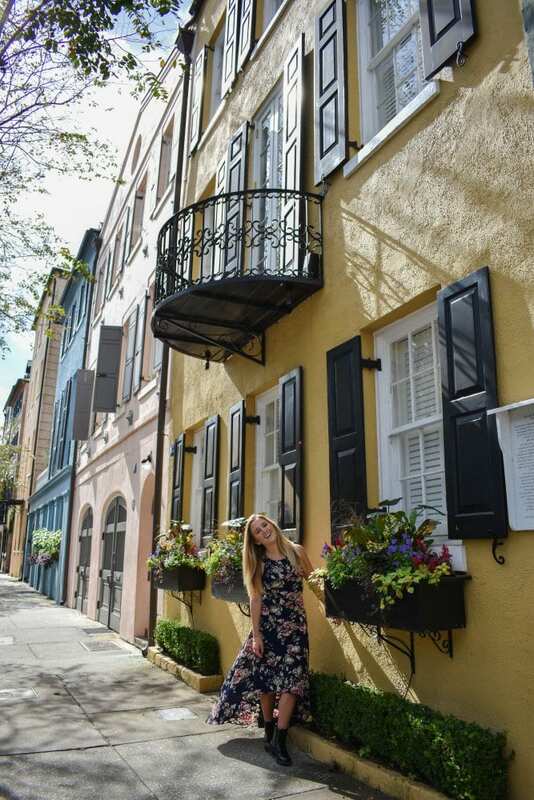 Historic Downtown Charleston: Another one of my favorite things to do in Charleston was to turn off of a street in The Battery and take a stroll into the heart of the historic district. Here, you will find the most beautiful and charming homes of the city. As you stroll through the streets, you will want to buy every house! I also recommend doing a horse and carriage ride around the city. We did one for an hour and it was one of the best ways to learn about Charleston and its history. 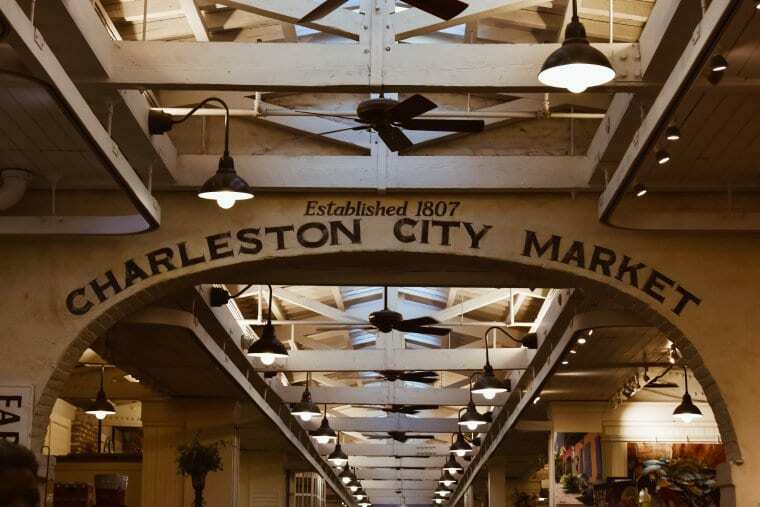 Charleston City Market: Established in the late 1700s, Charleston Market is a historic downtown market place that stretches four blocks long. It is here where you could find sweetgrass baskets (a Charleston staple) along with clothing, jewelry, art, home decor and food. Not only is there a day market, there is also one at night. It is definitely a spot you cannot skip out on during your trip to Charleston. Taste Southern Honey: Situated in the heart of King Street is Savannah Bee Company, a cute store that offers daily honey tastings. I love honey, so I was definitely in my glory when we did our tasting! We got to taste raw honey, lavender honey, wildflower honey and Charleston honey to name a few. In addition to edible honey, Savannah Bee Company also offers beauty and lifestyle products as well as gifts. They even offer bee garden tours in Wilmington Island, GA. Afternoon Drinks: When we were finished exploring the best of Charleston, we were ready for an afternoon drink! 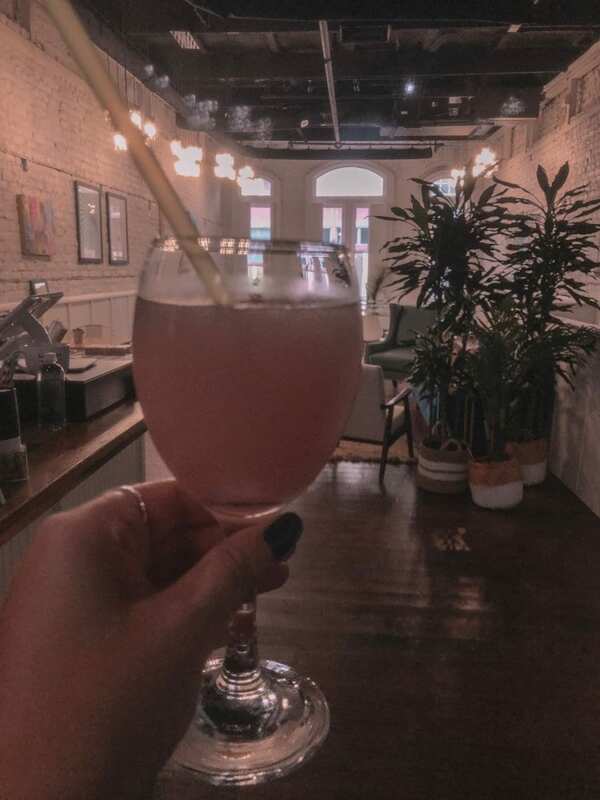 My cousin brought us to a cute boutique called The Skinny Dip on King Street that not only has a store, but also a hidden rooftop bar that sells coffee, tea and frozen wines! It is so adorable!!! There is an indoor bar with couches along with a little outdoor bar that has a cute swinging bench, coffee tables and beautiful décor. I highly recommend making your way to The Skinny Dip. It is the perfect midday stop! In addition to the Charleston store, The Skinny Dip also has boutiques in Palm Beach and Nantucket. Dinner and Dessert on King Street: For dinner on our second night, we were craving seafood. Since Charleston is a coastal city and is also close to the Atlantic Ocean, there are a lot of great seafood restaurants all throughout. Since oysters are a big staple in Charleston, my cousin took us to a lovely seafood restaurant called The Darling. 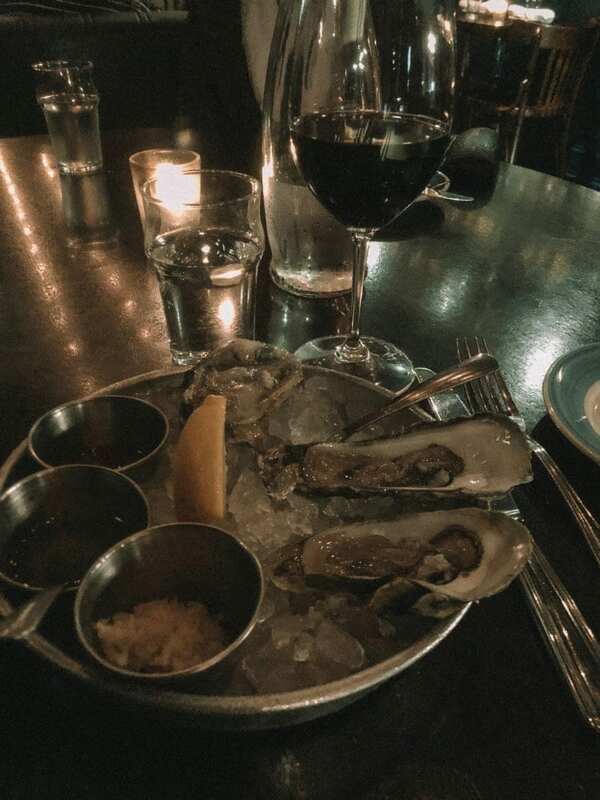 There are a lot wonderful oyster options for you to choose from at The Darling. I had the Gulf Oyster, the Blue Points Oyster and the Lowcountry Cups. They were amazing to say the least! 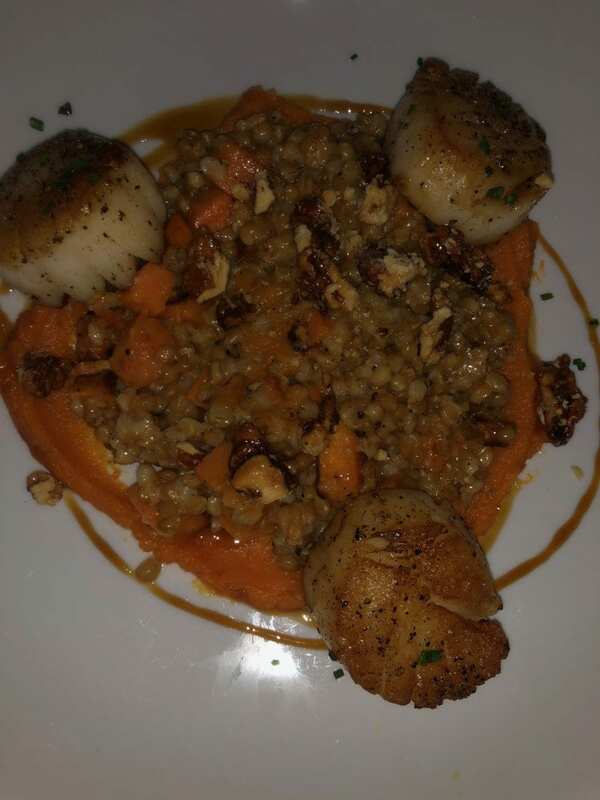 For my main course, I had the seared diver scallops that included corn and walnuts over a pumpkin sweet potato risotto. It was delicious! After our amazing seafood dinner, we headed over to Jeni’s for some delicious homemade ice cream. With locations all throughout the country, Jeni’s is a cute ice cream parlor with stringed lights and some amazing flavors to choose from! I had the brown butter almond brittle and it was mouth watering. Brunch on a Monday: You heard that right; we went to brunch on a Monday! Another amazing brunch spot next to The Mills House is Poogan’s Porch. 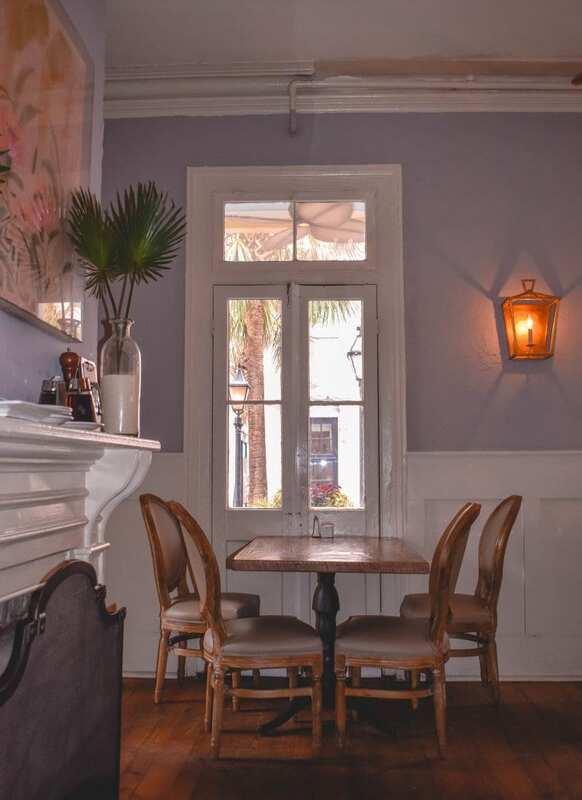 This quaint restaurant is Charleston’s oldest independent culinary establishment with a fresh approach to traditional southern cooking. 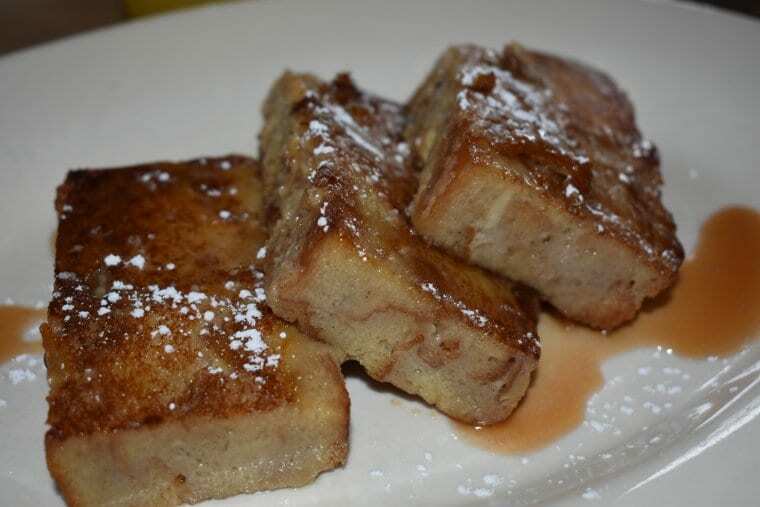 Not only could you enjoy brunch at Poogan’s Porch, they also offer a wonderful dinner menu. Poogan’s Porch opened in 1976 and has been a favorite to celebrities, politicians, tourists as well as locals and I could totally see why after my experience there. I absolutely loved how charming and warm the restaurant was from the moment I stepped inside. (You could also sit outside on the porch as well.) I also enjoyed the comforting music that was playing throughout the house. It added to the ambiance and experience. 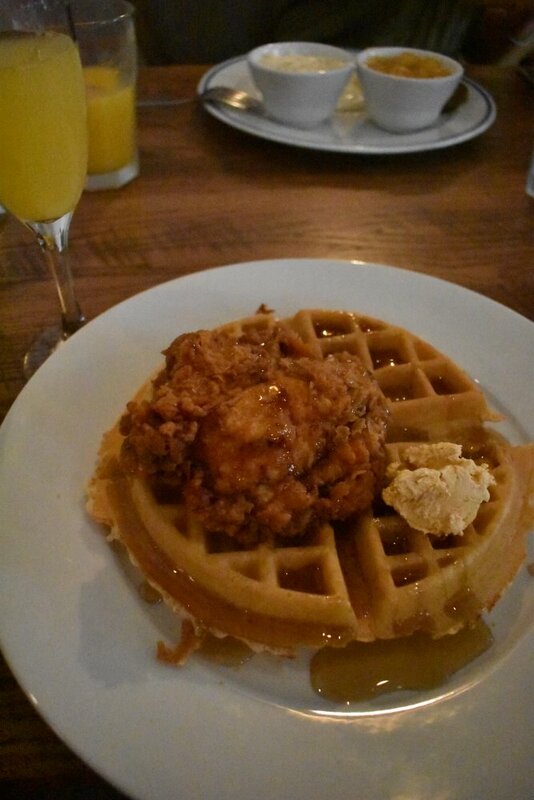 For brunch, I enjoyed a mimosa, warm and flaky biscuits as well as a chicken and waffle dish. I think the highlight of those three items was definitely the chicken waffles that I had. The buttermilk waffle melted in my mouth and the fried chicken was absolutely amazing! I am still dreaming about this southern brunch. Boone Hall Plantation: After brunch, we drove 20 minutes to the town of Mount Pleasant where we would get our first educational tour of a southern plantation. 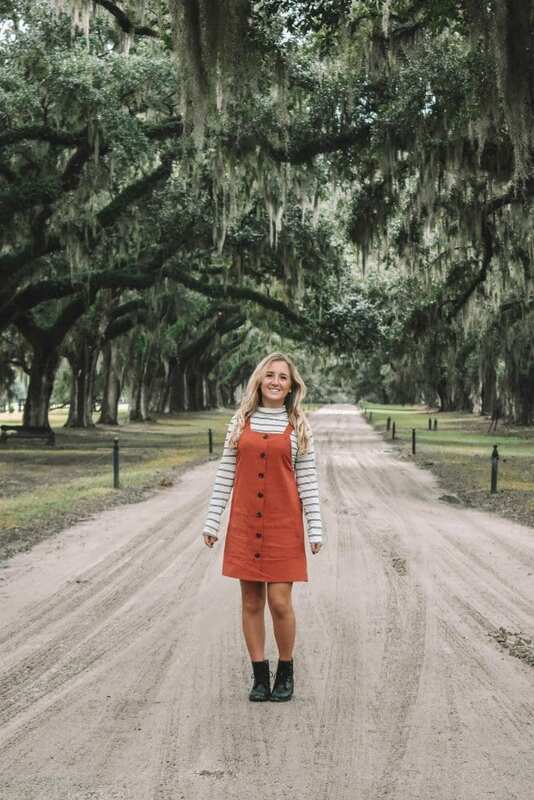 Rated as the top plantation in the Charleston area, Boone Hall Plantation is the best attraction that will bring you back in history. 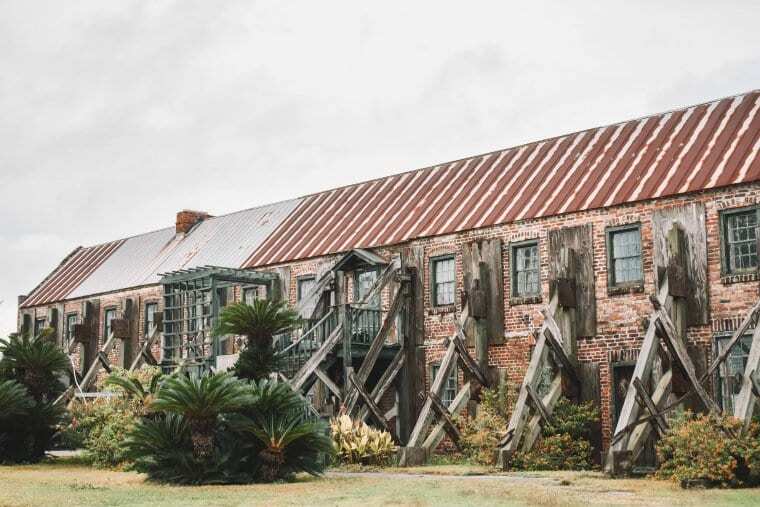 It is here where you could get an education on black history in America; slave history at Boone Hall (and also in the South in general) as well as the history of the mansion and the families that lived there through centuries. 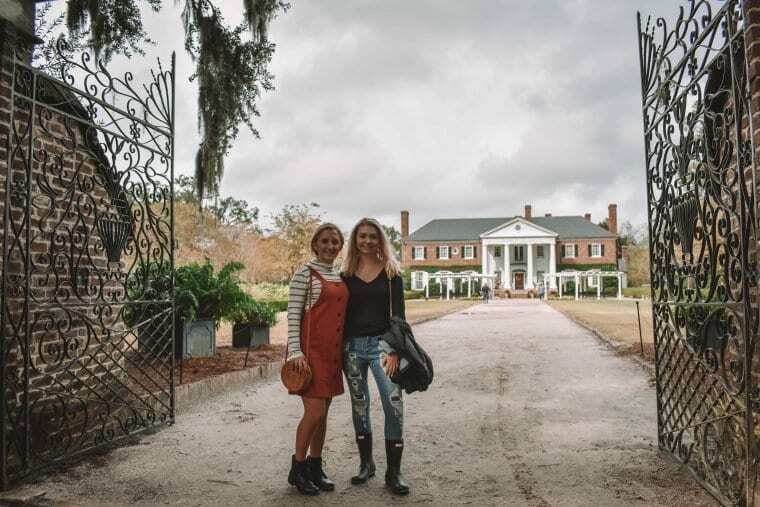 As we drove through the gates of the plantation, the first thing we saw was the breathtaking live oak trees with mystical Spanish moss that are evenly spaced out next to each other as you drive up to the main house. While you drive up to the house, which is next to the parking lot, you will see a beautiful horse farm on your right. On your left, you will see the old slave quarters that are now historical museums. 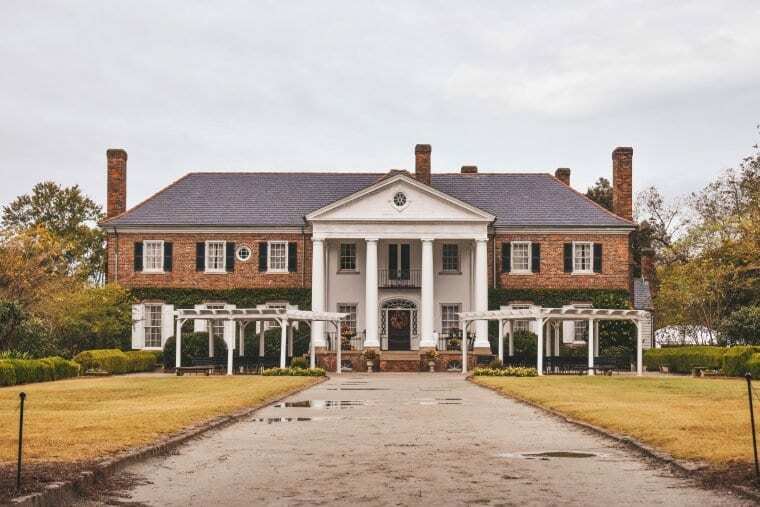 When you first arrive at Boone Hall Plantation, you will need to first visit the welcome center where you will be assigned a tour time to visit the big house. Meanwhile, especially if you have some time before your tour starts, I recommend seeing the slave quarters first. As you tour the slave quarters, it is all self guided. There are videos that you can watch as you enter each cabin as well as audio recordings. 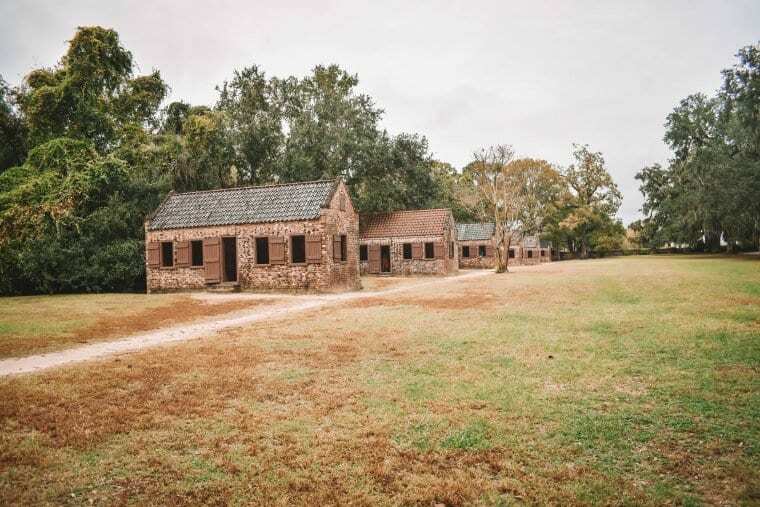 It is in these cabins where you will get a glimpse at the living quarters and lifestyle of slaves that lived and worked at Boone Hall. It is also in these cabins where you will get an education on black history in America from many centuries ago through 2009. It is a very emotional experience, but definitely the most educational and eye opening of the whole plantation tour. 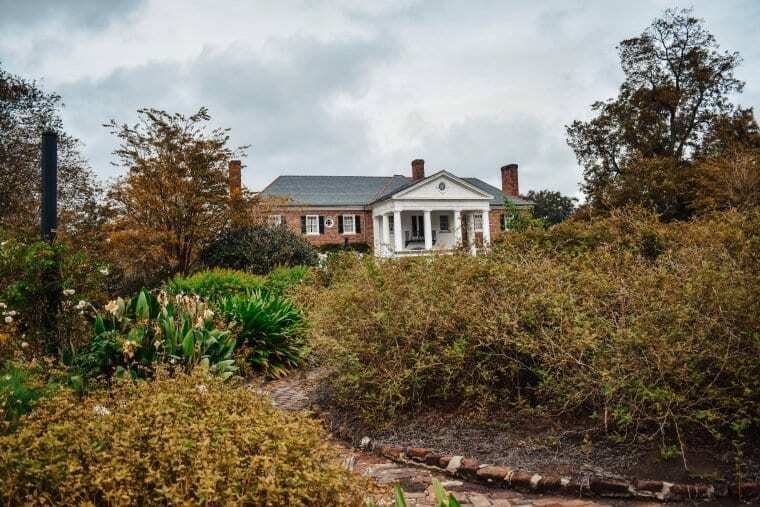 The guided tour of the main house allows guests to see how the Georgian-styled home blends recovered antique furnishings to recreate an atmosphere that would have surrounded a Coastal Carolina planter’s family centuries ago. 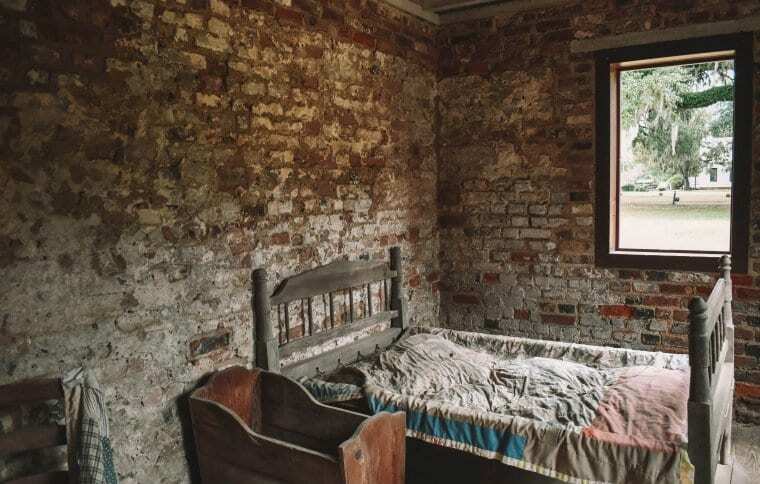 The tour will only take you through the bottom floor of the house because the current owners’ family will stay in the upstairs’ bedrooms at times, so it is understandable how they would want to keep it private. The inside of the house features an elegant, colonial atmosphere. There is a beautifully-detailed spiral staircase that you will first spot as you enter the house. 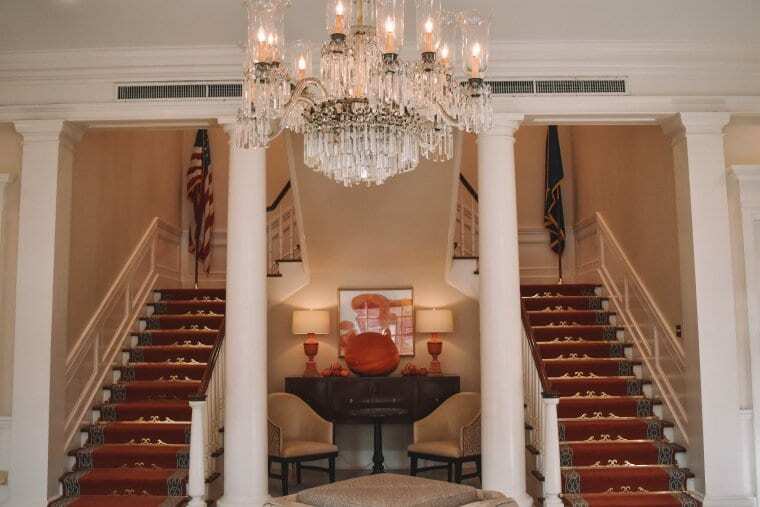 As you tour the rooms, you will see gorgeous chandeliers, old-world furniture and so much more. Unfortunately, we weren’t allowed to take photos inside of the home. After getting a tour of the main house, we entered into the beautiful gardens that feature a variety of plants, flowers and trees. Even though the gardens bloom year round, the spring and summer show the best of colors. I still think we got to see a lot of beauty during the fall though. 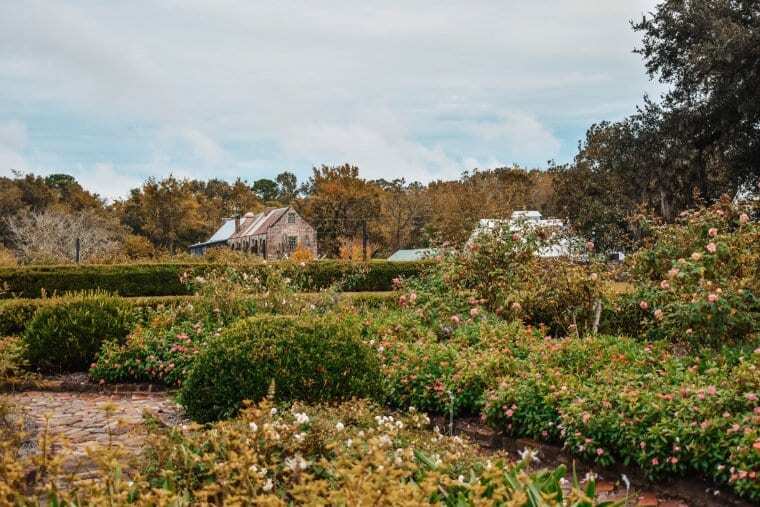 In addition to touring the slave quarters, main house and gardens, you could also watch a performance that best showcases “The Gullah Culture”. (A gullah was an African American living in the lowcountry.) You could also tour the butterfly pavilion and see the old cotton gin. 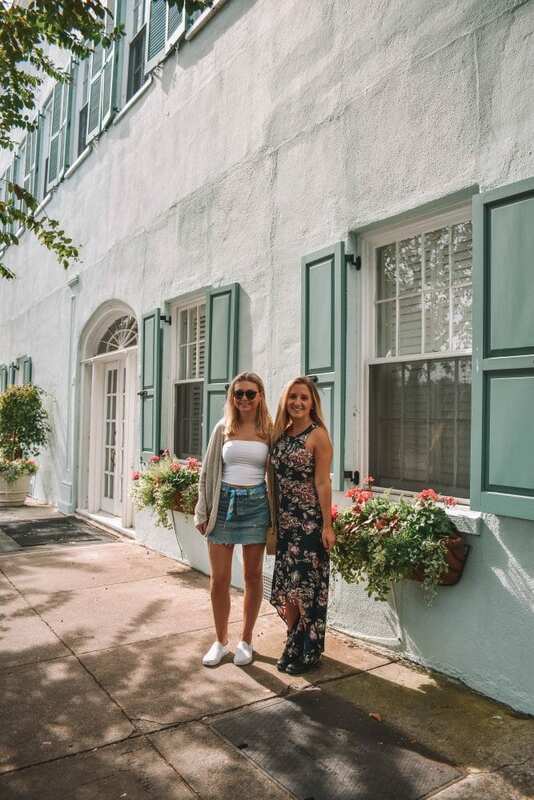 Aperitivos and Antipasti: When we were finished touring Boone Hall Plantation, we headed back to the city where we stopped on King Street for some mid afternoon wine and antipasti. Located on Upper King Street is a cute pizza joint called Monza that has both indoor as well as patio seating. I enjoyed a white wine, while my mom enjoyed a red. We all split a great antipasti dish of capicola, yellow tomatoes in olive oil with salt and pepper, garlic crostinis and salad. It was the perfect afternoon snack! In addition, Monza is also known to have some of the best pizza in Charleston. A Fancy Dinner: Prior to traveling to Charleston, almost everyone who I talked to that has been there before recommended that we eat at Charleston Grill. 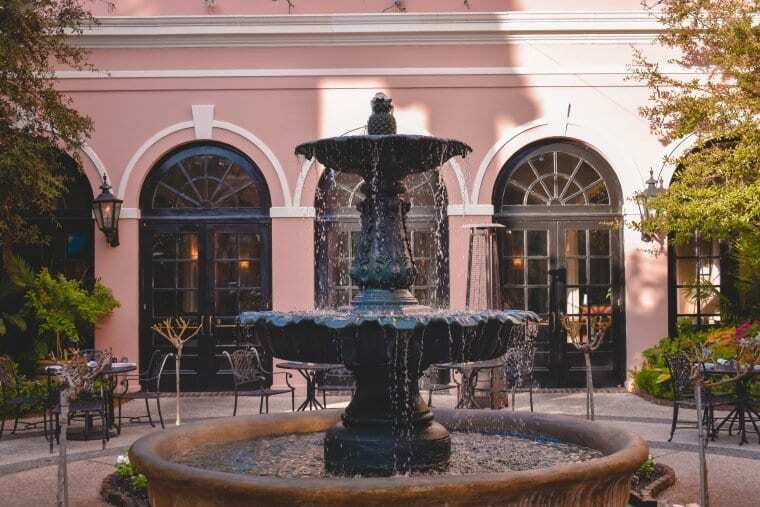 Located in Charleston Place is an upscale Southern-French restaurant that offers the BEST food in Charleston. On our last full night in the city, we decided to give Charleston Grill a try. 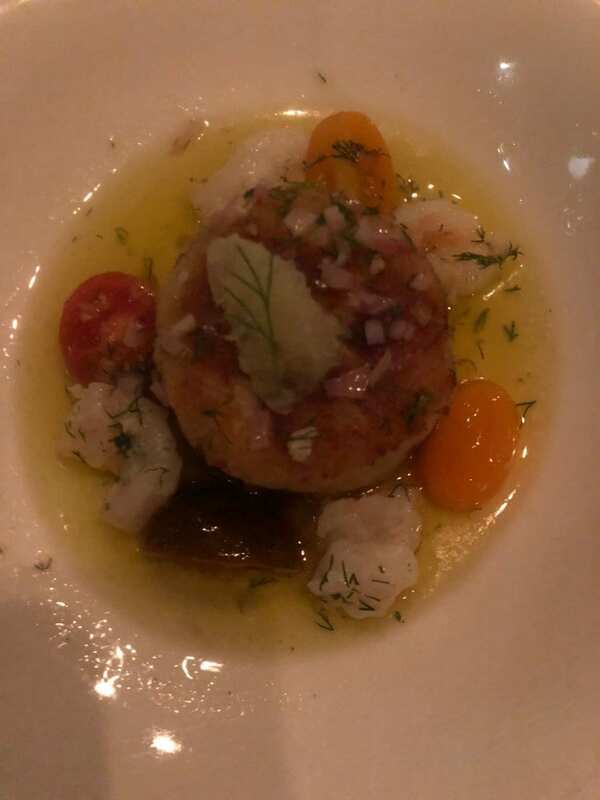 One thing to note about this restaurant is that even though it is pricey, you do get a lot of freebies such as a plethora of different bread options as well as sample tastings for appetizers, main courses and even dessert! Since everyone raves about Charleston Grill’s crab cake, we decided to get it as an appetizer and it was the best crab cake I’ve ever eaten! 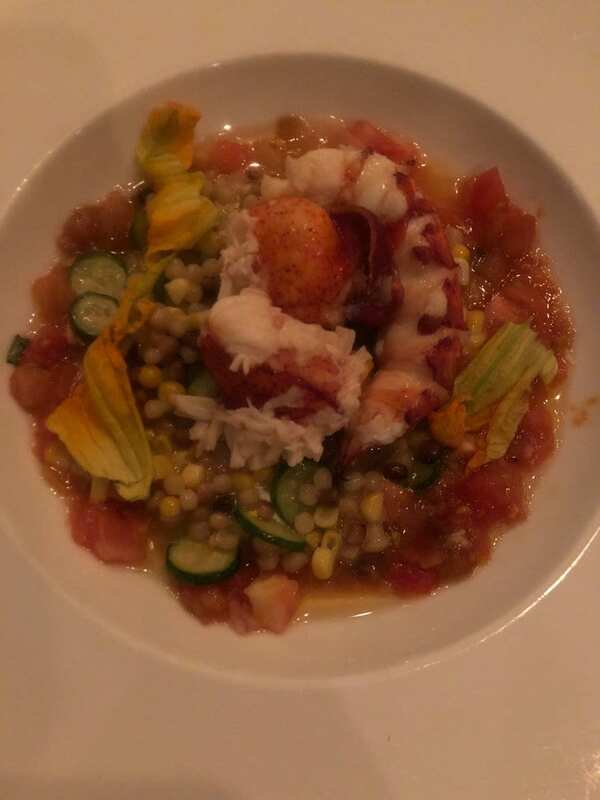 For my main course, I had the lobster and fregola sarda, which included lobster meat, summer pomodoro, corn, zucchini and ricotta. It was amazing! 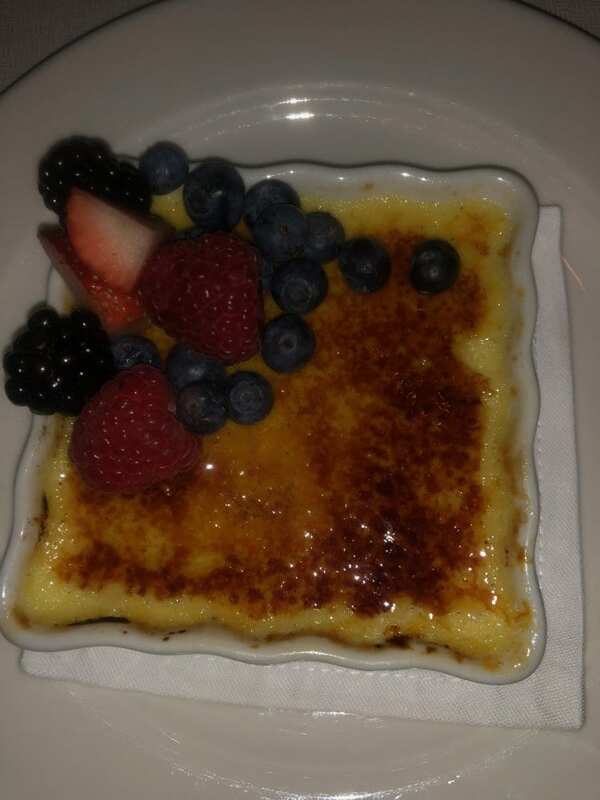 For dessert, we had the crème brûlée, which also did not disapoint. 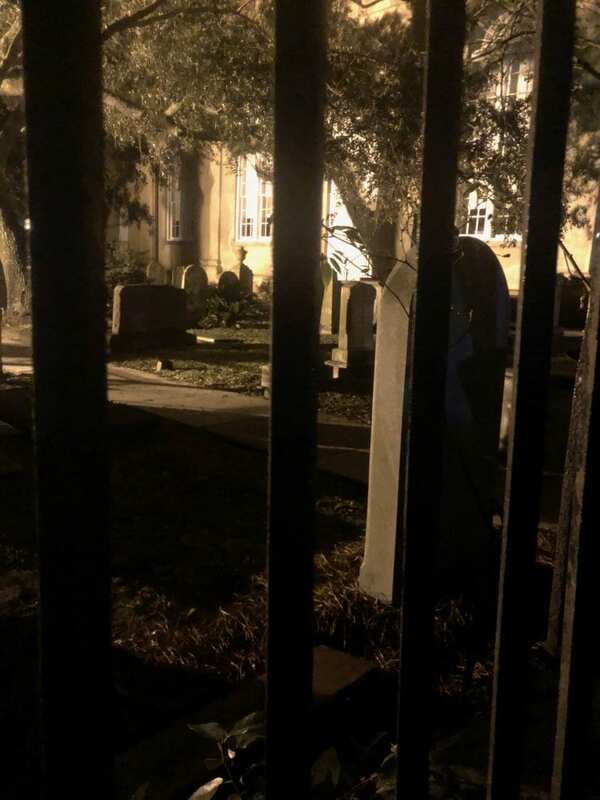 Ghost Tour: One of the most thrilling experiences during our time in Charleston was participating in a ghost and graveyard walking tour through Bulldog Tours. 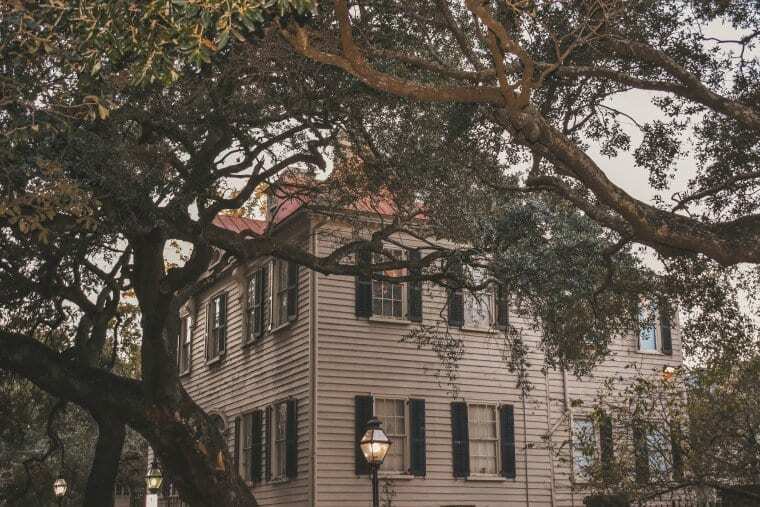 Charleston is the most haunted city in the United States, so it is definitely worth doing this tour! During the tour, we visited Charleston’s two most haunted graveyards. (Side Note: If you didn’t know already, the difference between a graveyard and cemetery is that a graveyard is attached to a church and a cemetery is separate.) In addition, we found out that our hotel was haunted as well as Poogan’s Porch, where we had brunch earlier in the day. 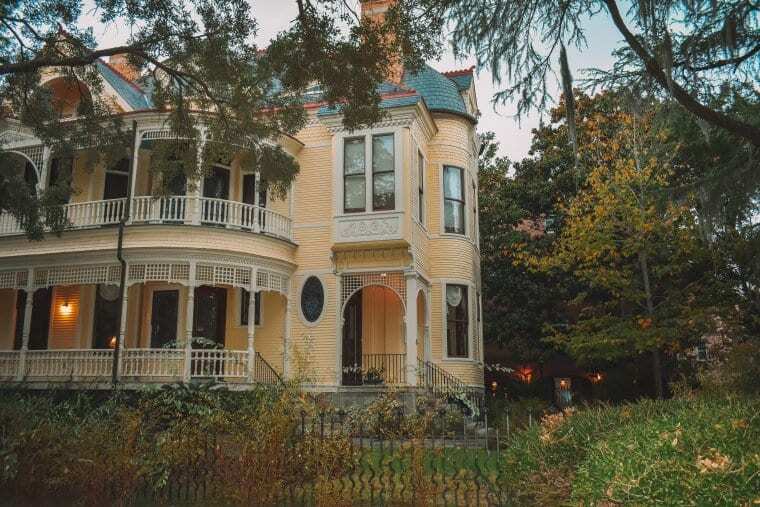 According to locals, The Mills House is where you can spot a woman from the 19th century in a purple dress between the hours of 11pm and 1am in the rear lobby. Apparently the rear lobby was a phantom from where the hotel helped burn victims after the devastating Charleston fire. In addition, people have also seen Confederate soldiers running down the hotel’s hallways in the middle of the night. It was my second time doing a haunted city tour. The first time was in New Orleans back in 2015. Overall, ghost tours aren’t too scary and the tour company makes it fun for everyone. Final Brunch: On our last day in Charleston, we made sure that we didn’t miss out on one last brunch. Also located in Charleston’s historic district is Hominy Grill. 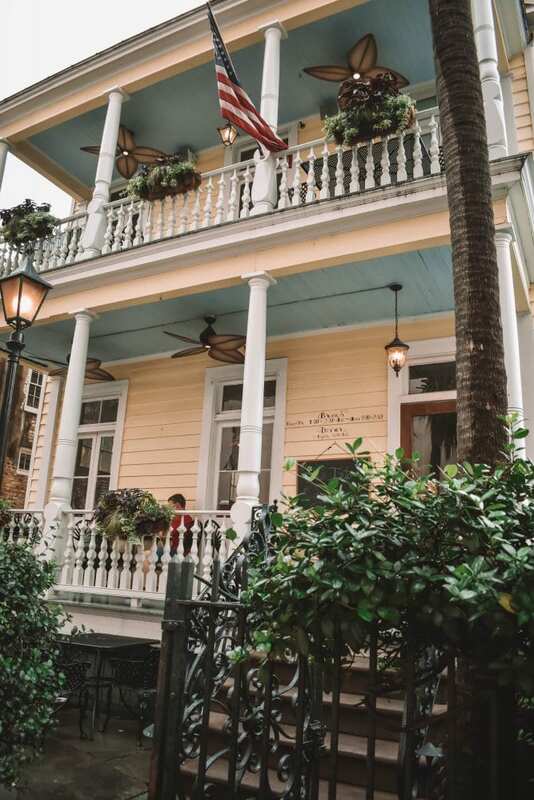 Situated in a quaint single-family house, Hominy Grill offers amazing lowcountry and southern dishes that will leave you dreaming for days. Just like the past two brunches, I enjoyed a mimosa along with bread pudding French toast with a bourbon caramel sauce as well as home fries on the side. It was amazing and the perfect last brunch. 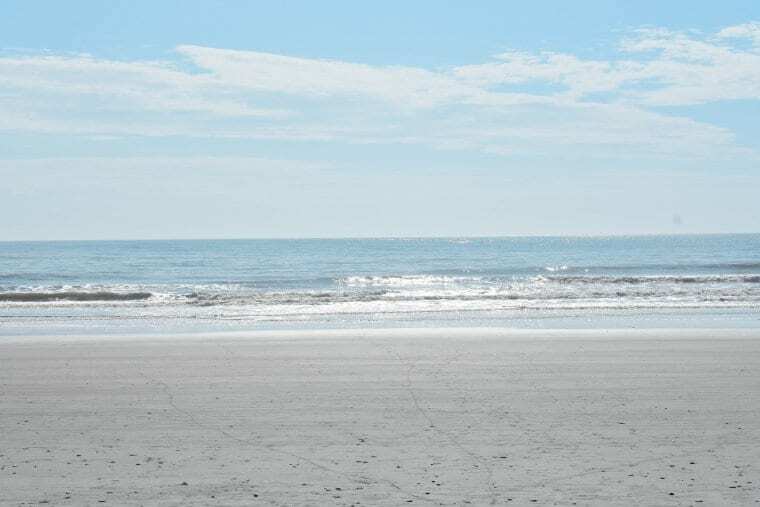 Day at the Beach: Before heading to the airport to fly back home, we decided to drive 20 minutes south to Folly Beach to relax and enjoy the coastal breeze. I absolutely loved Folly Beach because it was peaceful and relaxing. 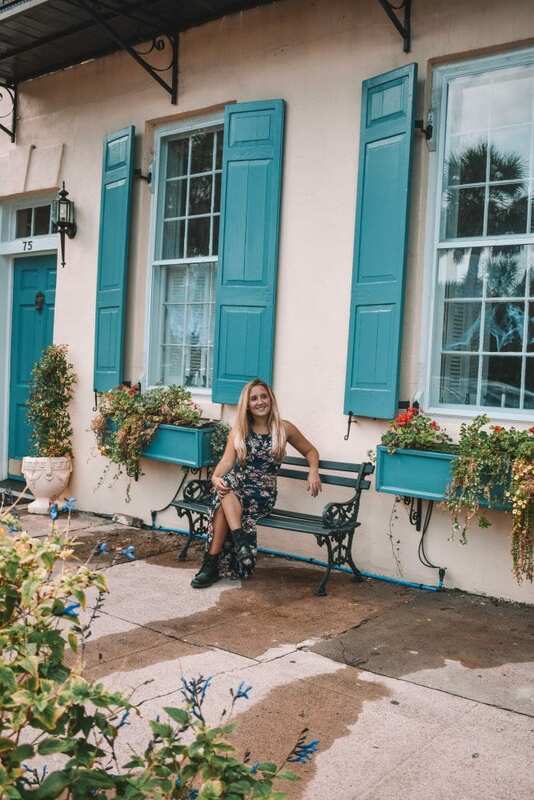 In addition, the town of Folly Beach was quite lovely as it featured brightly colorful homes, cute seafood restaurants, cozy coffee shops (such as Black Magic Café) and great beach stores. If you are spending some time in Charleston, I highly recommend squeezing a beach day in while you are there! 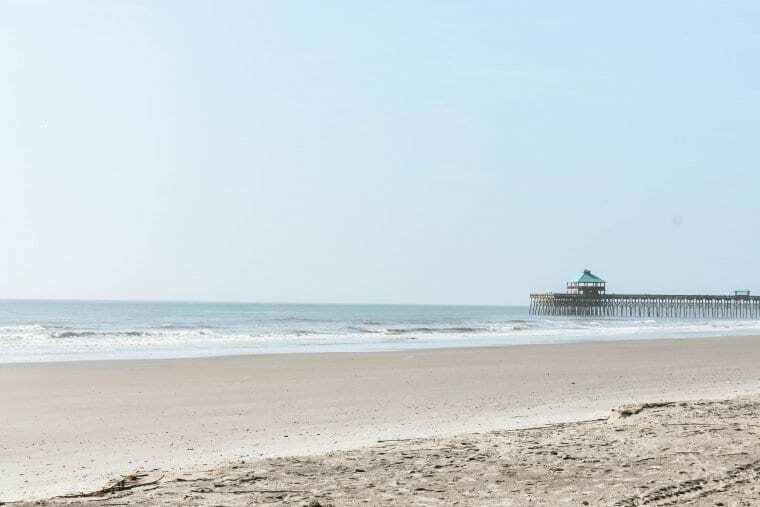 Besides Folly Beach, it is also nice to visit Sullivan’s Island as well as Isle of Palms. Discover more to see and do in Charleston through TripAdvisor. 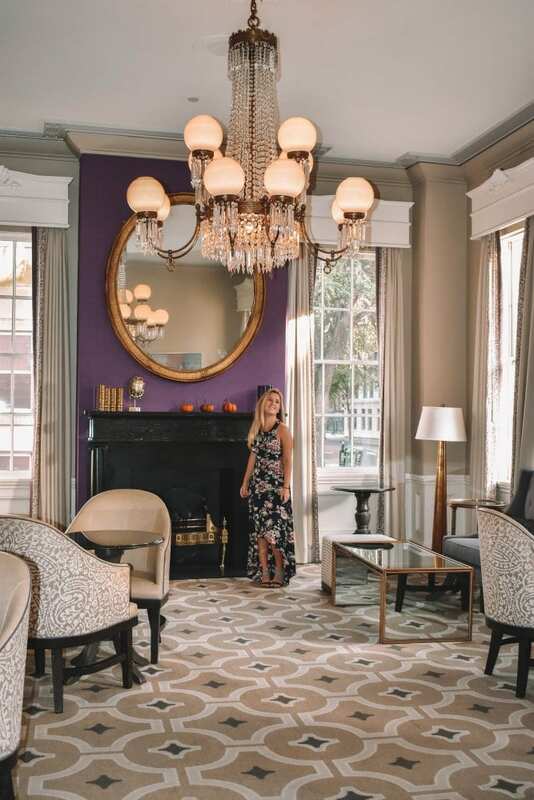 I hope you all enjoyed reading about my time in Charleston and discovering the perfect things to do during a long weekend getaway. 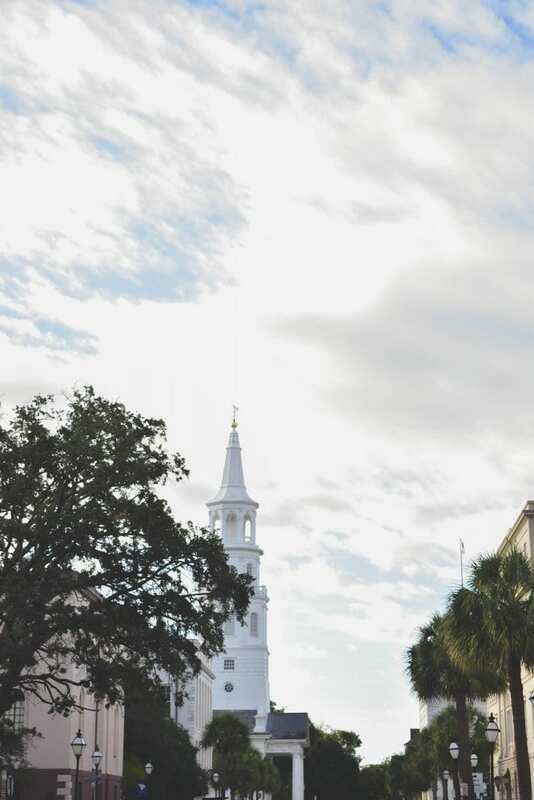 If you have any questions about my time in Charleston, please feel free to email me at info@browneyedflowerchild.com, contact me via social media or leave a comment below. So glad you made it Hominy Grill! It’s my absolute favorite in Charleston. The chocolate pudding is to die for, which I realize is not a common thing to say about any pudding, but this one is so unique! I’m the fun and whimsical blogger behind Brown Eyed Flower Child. I created this space to show the world through my eyes in a dreamy way while providing travel guides, stories, tips and recommendations, checklists, inspiring photography and other resources for the mid-budget, boutique traveler.